Ruby and The Magic Hour make me inordinately happy. Like, happier than any of your art has ever made me, and that's saying something! You are still amazing to me. Everytime I look at your work, I am amazed that so much talent comes from one human being. I LOVE, LOVE, LOVE Ruby. Perfect, perfect work and I love her little apple head-dress. She is my favorite from this blog post's offerings. Future Lives is quite amazing. I love the colors, the mood, the little girls and the bubble. Fantastic. I know I shouldn't pressure you to blog more, but you just cannot believe how much I look forward to your posts and seeing your new work. I just left you comments on flickr too after I had picked myself of the bedroom floor again from falling in complete awwwww!Your art always reminds me of the show Carnival.My daughter and I watch it over and over to get a taste of that gloomy dusty mood!I hope you saw it too and if not you realy should some day because I think you will love it! I am in love with this post, and I too look forward to your entries! The variety of magicians daughters are plentiful...he sure must have some interesting women....or are they all from the same mother? I love the bird cage theme too. I am on a bit of a bird cage rampage myself, only I combined it with my first love-of-the-moment...ships! i like the idea of your images being the spaces, pauses and turning points - if only because it helps explain why i'm always left at an utter loss for words when first encountering them. These 'Little Fictions' are all perfect examples. Though visual and on first glance existing in two dimensions, letting them leak into time and time leak into them opens them up in such wonderful ways. The Bored Aristocrats and their heads cocked just so grow more mischievous by the moment... we may never find out the story behind the one striped sock, but despite the danger we'll at least see what happens when we roll the dice. Ruby is a funny one - one moment dropped on the door step a la Paddington Bear (wooden buttoned coat and all), but tilt the head and she's leading us, welcoming rather than arriving. Future Lives still allows no words, reaching beyond explanation and deep into a shared pre-language. methinks. And Rafael may not marry (or even exist), but i bet estrella snowby causes him consternation nevertheless. I love the Magic Hour and Ruby. I love reading the little fictions you create with each work. The Bored Aristocrats has a 'Twin Peaks' feel for me. Those girls would be right at home in a David Lynch film. Rafael has an anime aestic to me. Something about his slim lines and posture. I think you could write some magical stories to go with some of your beautiful images. 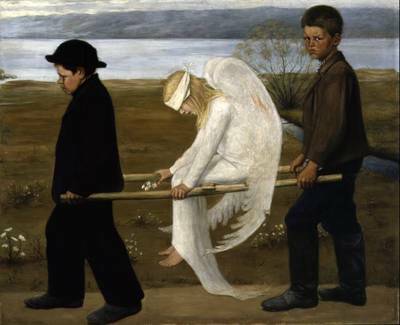 Oh my...the wounded angel is one of my all-time favorite paintings. i've carried around a print of it from a vintage calendar for almost 15 years. i'm so happy to see someone with your talent and vision appreciates it as much as i do. someone, only you and l would know about. Oh I love Bathroom Sister II, I need to save up and get both...we are moving into a new (much bigger and more expensive) place...they would be lovely on the walls. Benjamin - Estrella Snowby? My god, she is real, isnt she........i had my suspicions, but lets not forget the wraith either, all of her incarnations must be aknowledged. How's Ron by the way? !!! And thanks, everyone, for such encouraging words. Okay I love them all but very fond of the girl in red wearing Docs. and the Future Live piece!!! I am always in awe of your work!! I am in awe! I have just found your blog and I find your images haunting in a moreish way. I could not help just watching them not even looking at them it is almost as though they are alive on screen and 'Future Lives' I love it is almost like a woman giving away pieces of herself as she goes through life from childhood through to adulthood and then to second childhood. Your work is wonderful. As for bathroom sister 2, I find it to be perfect on my browser (safari) not to bright at all. In fact I think this is a wonderful image. How cool! Your work is so whimsical and dark. Love it! Incredible work and wonderful blog. wow!! Your work is amazing and the stories that you put along...I must say that I fell in love with Ruby...something about the apple head struck me as beautiful! I am completely amazed by your work. I'm with the previous commenter: that one sock- it is sublime.